We will pickup and pay for any motorcycle today anywhere in the USA Free Towing for any damaged, wrecked, junk or used motorcycles Sell the used, damaged, totaled, crashed and wrecked motorcycle for cash We know that our customers have choices to whom they can sell a motorcycle, so you might wonder why they choose us? Pickup and payment the same day! We will get you paid fast, and we will deliver with exceptional service. When you sell your sports bike or Harley-Davidson to TheBikeBuyers.com, you will have the satisfaction of working with one of our knowledgeable buyers. We Buy any Motorcycle for Cash in any Condition anywhere in the USA! We specialize in performing fast motorcycle purchases involving any bike any where and in any condition. Whether you have a wrecked sport bike, an old chopper, a vintage Harley Davidson or a perfectly good used racing motorcycle, simply click on Get a Quote Now or better yet, give us a call today at 877-751-8019! We will buy any where in the USA. We want your damaged, wrecked or use motorcycle. We also pay cash for fully running and hard to sell bikes. We love custom and old classic bikes too. 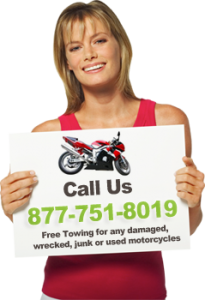 If you have an old Motorcycle, you need to call us today! That pile of plastic and metal could be cash in your pocket in a matter of days! We will give you a free estimate and discuss your options so you can make the best decision. We put Money in your Pocket Fast! When we come to pick up your motorcycle, you will receive the payment and pickup the same day. When you see the money in your hand, you just might say, “That was easy! Click on the Get a Quote Now button to start the ‘sell my motorcycle‘ process.